The orchestra performed at the Winter Music Concert in 2015 at the Church of the Redeemer for the first time. This past Sunday, Hopkins students, faculty and staff gathered for an afternoon of singing and playing in the Church of the Redeemer in New Haven. Entitled “Music of Winter,” the concert highlighted the talents of both the concert choir and the orchestra. This past Sunday, Hopkins students, faculty and staff gathered for an afternoon of singing and playing in the Church of the Redeemer in New Haven. Entitled “Music of Winter,” the concert highlighted the talents of both the concert choir and the orchestra. “It was a great program, featuring the Hopkins Orchestra, Concert Choir, Junior School choral ensembles, and chamber music groups. Music both old and new from around the world was performed,” said Erika Schroth, the concert choir director. 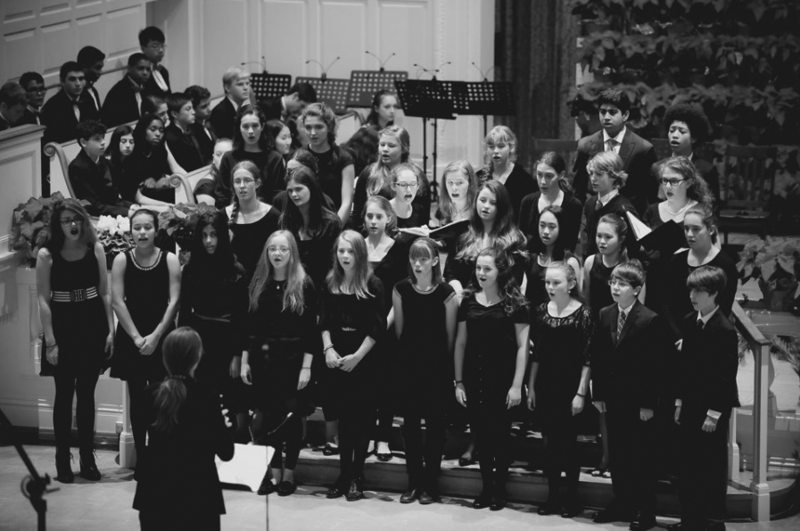 Many members of the Hopkins community look forward to the annual concert throughout the year. “The winter concert is always a lot of fun. It is also exciting to listen to the orchestra as well as collaborate with them on various pieces,” said Alex McCraven ’17, a choir member. Students not involved in concert choir also enjoy attending the event. “I love the mix of lovely music and holiday spirit,” said Helena Lyng-Olsen ’18. This year the concert choir, orchestra and chamber music groups had spent weeks preparing their performances for this event. “We worked tirelessly on a variety of music spanning from ‘Tchaka,’ a song about community performed in Haitian Creole, to the classic ‘O Holy Night!’ commented McCraven. Schroth agreed: “I am so impressed with the focus and passion the students bring to their work. We programmed some very challenging music and they absolutely rose to the challenge.” The concert showcased this hard work and talent of many members of the Hopkins community. Over the years the nature of the concert has evolved. In addition to moving from Trinity Church on the Green to the Church of the Redeemer in East Rock, the concert has expanded to include a larger variety of musical performances. “Two years ago, the Hopkins Orchestra appeared for the first time on the program - it was exciting to open up this avenue of collaboration for our students. This year, the orchestra will perform more pieces on the program - it will be their main concert event of the first semester,” commented Schroth. “The chorus and orchestra have so much to share with each other and to learn from collaborating with each other,” said Robert Smith, the director of the orchestra program.